Attention all Homeowners: Is House Wrap Important? - Roof Time, Inc. YES! Around 2004, the building code for many states began requiring the use of house wrap. If your home was built before 2004, your home may not have house wrap protection. 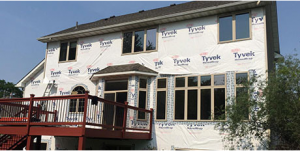 House wrap is a weather resistant, protective barrier that helps prevent moisture from entering a home. It is a thin layer of spun-bonded polyethylene that allows a home to breathe properly. 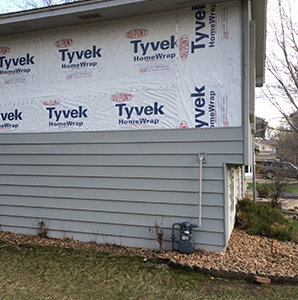 House wrap prevents moisture buildup beneath the siding that can cause mold growth and rotting wood. *Picture of mold growing through the wall. It’s extremely important that house wrap is installed properly. Proper flashing components or techniques are important to use as well as making sure all seams are taped. House wrap is not supposed to overlap more than 10 inches. If a house already has house wrap, it must be completely removed and replaced anytime siding is replaced. This is especially important because the old house wrap would have nail-hole openings throughout, and not offer full home protection. If you have concerns about your home, it may be worth calling a licensed, well reviewed contractor. A roofing or siding contractor could help you inspect your home and prevent further damage. If you are a homeowner, mold growth and rotting wood is something you absolutely do not want to overlook.